While the pictures in the book and the accompanying text do a great job of explaining the circumstances and perils facing the Southern Region at that time, it may be difficult for someone not familiar with the Penn Central system to know where all of these places are. Fortunately, help is now here! Using Google Earth, you can now locate many of the photo locations in the book. I have put together a KMZ file that you can load into Google Earth with placemarks to show where most of the photos were taken. Download the KMZ file here (right-click and select "Save" to save it to your computer): sampling.kmz. Save this file to your hard drive and launch Google Earth. Under the File menu, select Open. Select the sampling.kmz file that you just downloaded and open it. 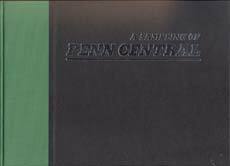 It will add a folder called "Sampling of Penn Central" under your My Places. Then double-click on each link in the folder (sorted by page order) to see where each photograph was taken. Not all photos in the book were able to be located on Google Earth. In many rural places, the imagery was not sharp enough to find the exact location. Other photos did not provide enough detail to be accurately located. Please note that each placemark represents where the photographer was standing, and not necessarily where the subject of the photo was located. Each placemark tells which direction the photographer was facing. For many of the marks, Google Earth will rotate to face that direction. For others, you can manually rotate the view yourself. For a tour of the book, select the first placemark in the folder, and under the Tools menu, select Play Tour. Google Earth will then fly you on a tour of all of the placemarks in the book. You can follow with your copy of the book. The tour can be paused or stopped using the buttons at the bottom of the My Places pane. I hope you enjoy your tour around the Southern Region with Google Earth. If you have any questions or find any mistakes, feel free to contact me.